What do we do with your old oil? What happens to your old motor oil after you leave the shop? Most people don’t know. Most people don’t really think about it. 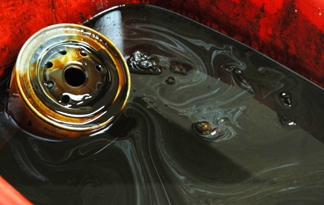 Because oil can easily damage the environment if it seeps into soil or ground water, Lowell’s has recycled your used motor oil for many years. Motor oil is made up of about 85% oil and about 15% additives. Contrary to perception, the oil component of motor oil doesn’t typically break down. As the oil is used to lubricate your engine, however, the additives do break down as they absorb contaminants. Once those additives and contaminants are removed, the remaining oil can be re-refined and reused as new. When we drain the used oil from your vehicle, we use rolling steel containers with an attached drain pan which helps us catch the oil. We also capture other vehicle fluids — from your transmission, power steering, brakes, and cooling system, for example — in much the same way. When the rolling oil containers fill up, we pump the oil out into much larger standing tanks. Every two weeks, a recycling service comes to our shop and pumps the used oil into their trucks. We also store used oil filters, which they pick up every few months. After picking up the oil and filters, our recycling service transports the oil to their facility in Columbus, Ohio. There, they re-refine the waste oil to remove fuel, water, additives, and other contaminants, and they distill the refined oil into new petroleum-containing consumer products. They also crush the oil filters, extract the old oil, and send out the filter body as scrap metal to other recyclers. Related Post: A greener oil change See how Lowell’s offers high-quality oil changes using recycled oil. Eighty-six percent of our waste oil is recycled directly back into new motor oil, like Valvoline’s NextGen oil. About 5% is used for asphalt paving and roofing materials. The rest is used for other petroleum-based products. In the video above, Valvoline explains how old motor oil can be recycled into ‘as-good-as-new’ (in our case, we think of it as ‘better-than-new’) NextGen oil. Call the shop if you’d like to learn more about our recycling process, or about how you might use recycled products for your vehicle.